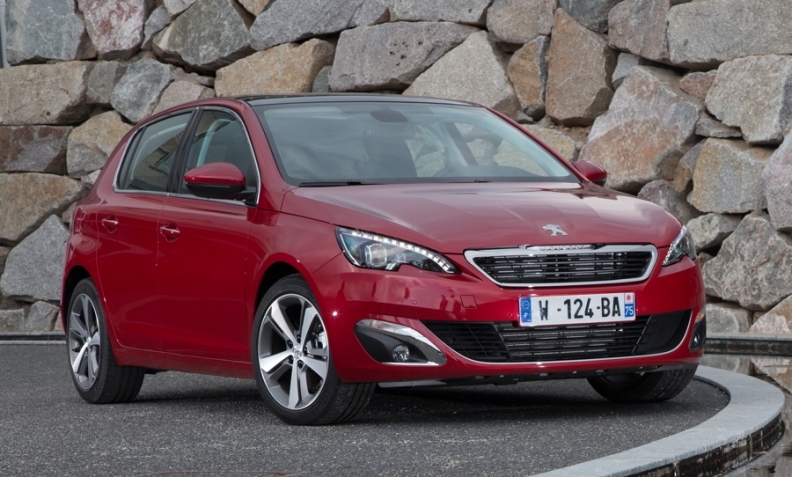 The Peugeot 308, the reigning European Car of the Year, has helped to boost PSA sales. Europe's passenger car registrations rose 4 percent in May as growing consumer confidence encouraged purchases of new models. Volume brands such as Renault, Peugeot, Opel and Skoda gained sales while Ford Motor, Fiat and Hyundai lost ground. Registrations in the EU and EFTA markets increased to 1.13 million vehicles from 1.09 million a year earlier, industry association ACEA, said. Five-month sales gained 7 percent to 5.62 million cars. Demand increased for a ninth straight month in May, but the level of deliveries was the second lowest for the month since 2003, ACEA said in a statement today. "It's a modest recovery from low levels of overall demand," said Marc-Rene Tonn, an analyst with M.M. Warburg. Demand is set to keep improving during the coming months, said Christian Ludwig, an analyst with Bankhaus Lampe. "After six years of declining auto sales in Europe, there should be significant pent-up demand that should drive growth in the next couple of years." Analysts said new products are boosting sales at Renault, PSA and Opel. "It is clear that new models and changeover is having an impact with Renault benefiting from new model cadence and both BMW and Daimler suffering some weakness as they see model changeover at Mini and the aging of Smart leaving a negative effect," said George Galliers from International Strategy & Investment (ISI) in an email. "We expect Renault to continue to take market share in the region, given the relatively youthful profile of its model line-up," Galliers said. Download PDF, above right, for full European passenger car registrations for May and first five months by automaker, brand and market. Among the top 10 car sellers in Europe, registrations at third-ranked Renault jumped the most in May, at 18 percent, with gains of 9.5 percent at market leader Volkswagen Group and 4 percent at second-place PSA/Peugeot-Citroen. Renault's low-cost Dacia division, which has revamped its Duster SUV and Sandero hatchback, posted a 24 percent surge in European sales last month, while the parent company's namesake brand, bolstered by the Captur crossover, sold 16 percent more cars. Sales jumped 23 percent last month at Volkswagen's Skoda marque, helped by a new version of the Octavia compact car, and 22 percent at the Seat nameplate, which added a station-wagon variant to its Leon compact vehicle line at the end of 2013. Registrations by the namesake VW brand and the Audi luxury division each rose 5 percent. Demand at PSA has been propelled by the Peugeot 2008 compact SUV and 308 hatchback, with the company boosting production of both models this year to match orders. Peugeot brand's European sales rose 5 percent in May, and Citroen's registrations increased 3.5 percent. Peugeot brand's European sales have the potential to rise more than 10 percent this year, Maxime Picat, head of the division, said Wednesday in an interview on France's Radio Classique. Opel/Vauxhall sales rose 6 percent last month, helped by the Mokka compact SUV and Corsa small car. GM's group registrations in Europe dropped 7 percent as the Chevrolet nameplate is being withdrawn from the region. Opel CEO Karl-Thomas Neumann outlined plans early this month to reach an 8 percent market share by 2022. That compares with a 6.8 percent share for Opel and Vauxhall so far this year. Sales fell 3 percent at Ford Motor and 3 percent at Fiat Group with Fiat brand down 4.5 percent, Alfa Romeo down 20 percent and Lancia down 2 percent. Asian brands had mixed results with registrations up 10 percent at Nissan and 2 percent at Toyota. Kia sales rose 4 percent, while volume at Hyundai was down 3 percent. BMW posted a 2.5 percent decline in group European sales as an 18 percent plunge at the Mini small-car brand, whose lineup is being updated, overwhelmed a 1 percent gain at the namesake BMW marque. Sales by Daimler's Mercedes-Benz brand rose 6 percent, buoyed by demand for the new C-class sedan and GLA compact SUV. Registrations at Daimler's Smart division fell 16 percent as the unit prepares a new version of its main two-seat model and a four-seat car. Four of Europe's five biggest markets kept growing in May, with gains of 5 percent in Germany and 8 percent in the UK offsetting a 4 percent drop in Italy. Deliveries surged in the region's southern markets that were hit by the previous economic recession, with growth of 17 percent in Spain, 37 percent in Portugal and 42 percent in Greece. The French market was flat with a gain of just 0.3 percent. Analysts said excess production capacity as well heavy discounting and other incentives for buyers were distorting the true level of demand. "It's a patchy recovery that's not particularly strong," said Jonathon Poskitt, head of European forecasting for LMC Automotive. "We need unemployment to decline before we can expect a more concerted recovery." Unemployment remains near a record high of 12 percent in the 18-nation euro zone. Discounting in Germany's auto market eased last month, with cuts narrowing to an average 11.3 percent off the recommended price from 11.6 percent a year earlier, according to trade publication Autohaus Puls. Europe's car market is recovering from a two-decade low reached in 2013. Industry executives are predicting growth in regional auto demand of 2 percent to 3 percent this year. Consumer confidence in the euro area rose in May to the highest since October 2007, according to figures released last month. The ECB cut its deposit rate below zero in an effort to counter possible deflation as economic growth remains weak following a recession that ended a year ago.